Motorcycle Sales, Service & Parts. Red Devil Cycles is committed to 100% Customer Satisfaction. Family Owned & Operated, Fully licensed and insured. Serving the treasure coast since 2001. We can offer you all of the service and piece of mind of a major dealership without the headaches and inflated costs. 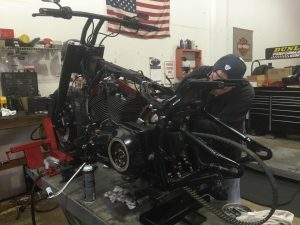 Whether it’s just a technical question you need the right answer to, or if you are in the market for a ground up custom built chopper, we’re here to listen. Offering Discounted prices on Parts and Accessories and a reasonable Labor Rate. Not only does Red Devil Cycles, Inc. have a fully operational Service Department but we also have a retail area and showroom for your convenience, offering a full line of motorcycle parts, accessories and apparel. We provide genuine Harley Davidson parts as well as others. If we don’t have it, don’t worry..we’ll get it! From Detailing to Total Rebuilds and Customs from the frame up, Red Devil Cycles is here to serve all of your Harley Davidson needs. We offer on site TIG welding services for repair and fabrication and full dyno service is also available. Stop by and see the guys at our Stuart Location or give us a call with any questions you may have. Just one block north of Treasure Coast Harley Davidson, turn East onto Gran Park Way. 1/2 Mile Down on Right Side.